(Newser) – For those concerned that the latest iPhone wasn't revolutionary enough, the latest Apple patent application to make headlines would seem to indicate that Tim Cook and Co. are truly getting back to basics: It's made out of paper, has handles, and you can put stuff in it. Or, as Apple puts it, via Forbes: It's "a retail paper bag, comprising: a bag container formed of white paper with at least 60% post-consumer content." 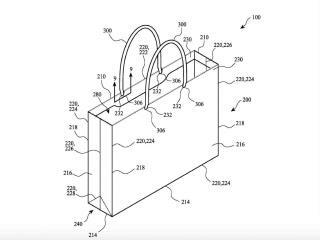 Yes, Apple is trying to patent a paper bag. Now, to be straight-faced about it, the Guardian notes that it's a very nice paper bag, saying that, "the innovation, in this case, is how Apple intends to hold the bag together with such a high proportion of recycled material." It seems that the bleach involved in producing regular white paper bags out of recycled content leaves them fairly weak, so Apple has added reinforcements and a sure-to-be delightful handle "formed entirely of paper fibre yarn knitted in an 8-stitch circular knit pattern." That'll apparently make it feel extra soft to hold. Next on Newser: Can Blacks 'Get a Little' Ahmad Rahami Treatment? The greatest thing about it is that it's only going to cost $299! I can't wait to get in line with the other lemmings for my chance to buy one of the first ones available! And iDiots will be standing in lines for 72 hours to be the first in their mom's basement to own one. People need an iBag to carry all of their iStuff.